I'm not very experienced with specific 3d model formats, but I cannot seem to find many others online having the same problems as me. Essentially, I have a model in the form of an FBX which I am trying to edit using Blender. The original model is in ASCII FBX format, so I converted it to binary FBX using the Autodesk FBX Converter, and also converted it to an OBJ file for comparison. When importing the binary FBX to Blender, I am met with the following mess (which is also extremely scaled down): This model is supposed to be humanoid. Yikes. And this result does not seem to change regardless of how I tinker with the checkbox options for the FBX importer. If I set the armature to be in rest position, instead of pose position, I get the following result: This is better. The mesh is not distorted like it was before; however, the separate pieces are disconnected and they are rotated and displaced seemingly at random. After I repositioned and rotated each part, I see the following, which is the desired model, and also what I get from the OBJ file mentioned above: However, when I set this back to the pose position, it returns the unholy abomination in the first image. This is especially unfortunate, as the armature itself seems to be in the right shape for the model; there's just some problem of which I'm not really sure. 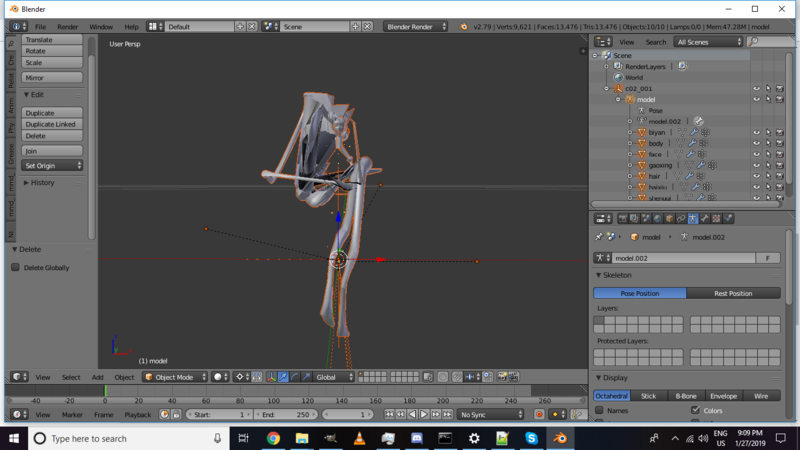 Is there a way I can fix this issue, ideally to get the armature already there to work with the model? Browse other questions tagged rigging armature bones import .fbx or ask your own question. How to match an armature to a .fbx file?